INTRODUCTION: When the long-awaited third installment of the Sixth Sun series by Thomas Harlan has finally had a firm publishing date in early August 09, I was very excited. I got an arc and not only I loved it a lot and it became a co-#1 sf novel for 2009 so far, but it motivated me to re-read the earlier two books and then I decided that a full post is needed to discuss the series at length before reviewing "Land of the Dead" in early August. OVERVIEW/ANALYSIS: In the late 1200's Kublai Khan the most famous Mongol Emperor, founder of the Chinese Imperial Yuan dynasty and grandson of the famous Genghis Khan, tried to invade Japan twice. Before 1945 that was the only planned serious invasion attempt on the Japanese main islands in historical times and it could have succeeded but the Tai-fun - the divine wind - scattered the main Mongol fleets twice and the samurai made quick work of the few survivors. What if it turned out differently and the Mongols conquered Japan, while the remains of a Japanese evacuation fleet washed out on the shores of Central America, where the survivors allied with the rising Mexica power and gave them horses, steel and a ruthless way of making war. That is the premise of this wonderful series and while it starts some 1200 years later in a human interstellar empire dominated by the Mexica/Japanese alliance, there are many flashbacks to earlier times as well as a lot of Aztec folklore and Japanese tradition. As another tidbit, the Skawts allied themselves early with the dual empire and now they form the backbone of the Imperial Eagles, an elite force that acts as bodyguards to the Mexica ruling family, while the Anglish are history, the only serious European resistance coming from the Russo-Scandinavian alliance that was ultimately crushed after a limited WMD war that led to immense destruction on Earth. In addition to the unusual setting, there is also another difference from most space opera, humanity being a relatively puny power that needs strong allies to thrive in the ruthless galactic game of power. The fabled "First Sun" species who are rumored to have had the power of gods left scattered ruins with artifacts of immense power and the official chartered archaeological "Company" investigates them. The main heroine of the first book and a very important character in the two followups , Dr. Gretchen Andersen single mother of three, born in a politically dispossessed class (Scandinavian exiles on a Skawt planet) is an employee of it, though she is slowly drawn in the intrigues of the Nauallis and the Mexica secret service, "The Mirror". The Nauallis - "roving imperial judges" - all male though there seems to be a women organization too - have only one mission, namely the protection of the human race in a hostile universe; at all costs, with individual or even mass deaths if necessary. Another main character of the series Green Hummingbird is an elderly Nauallis who will become a sort of mentor to Gretchen and protector to Navy Captain Hadeishi who is the other main series character so far. And then we have the second component, military hard sf with star-ships, their crew, action, repairs, lots of details about ship-life and such. And to my surprise the two components - space opera mysteries, fabled all powerful races, archaeological investigations and weird aliens on one hand and the mil-hard sf part on the other mix quite well overall and the result is a very absorbing series, a dense but very compelling read that you do not want to put down until finished. 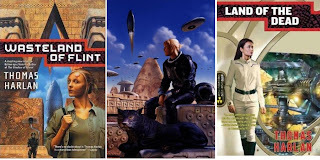 The series starts with a bang in "Wasteland of Flint" when Gretchen Anderson is diverted to the strange planet of Ephesus where The Company has an archaeological dig that has been finding First Sun artifacts but has been out of contact for a while. Arriving on the scene in an Imperial Cruiser Cornuelle commanded by Hadeishi, which was very unusual in itself since the Navy does not act as civilian transport for the likes of her, Gretchen discovers the exploration ship abandoned in orbit with everyone dead except the shuttle pilots who have been luckily stuck in an airlock for a while, and later they find the bulk of the archaeological party on Ephesus alive but running dangerously short of supplies. When Green Hummingbird makes his presence on board Cornuelle known to Gretchen and Cptn. Hadeishi discovers a possible Russo-Scandinavian rebel mining operation in the system, the stakes are raised a lot. "Wasteland of Flint" solves the main threads and leaves the reader wanting for more. Starting two years later, "House of Reeds" takes place on the very old planet of Jagan, home of an alien race that has seen nuclear wars, false space exploration starts and is rumored to have been around when the First Sun people roamed the Galaxy, with the House of Reeds of the title maybe the oldest continuously inhabited building in known space. The problem is that now Jagan is under Mexica "protection", some native leaders are getting restless, some Scandinavian rebel groups see an opportunity to bloody the Mexica so supply the local nobles with modern weapons and to top it all the "Flower Priests" have chosen Jagan to bloody the disolute Mexica Prince Tezozomoc about whom tabloids on Earth have been having a field day recently. So under the leadership of the elderly priestess/agent Itzpalicue, they are preparing a local war in which Tezozomoc will "cover himself with glory", his survival being optional. And the agents/priests need a ship to sacrifice in the ritual war, so when the battered Cornuelle arrives in the system and Itzpalicue realises Hadeishi is a pupil/agent of old enemy Green Hummingbird, what better sacrifice. And the fact that all the present Mexica squadrons are clan based and are commanded by European officers since a French admiral needs taking down a peg too, so Hadeishi is the only Japanese senior officer around does not hurt either, since Hadeishi and his crew are supposed to die honorably fighting against huge odds. Gretchen is also sent to Jagan to investigate the digs there and especially the House of Reeds so she is in the thick of things when the expected mayhem starts. "House of Reeds" solves its threads and the sequel "Land of the Dead" picks up where this one ends and takes the series to even a higher level. Just great, great books, dense but compelling and highly, highly recommended. I am so GLAD to see this post! I have the first two books of the Sixth Sun but never read them as it seemed the third (And forthcoming books) just seem to vanish off the radar. And I had given up hope, and decided not to bother with the first two books. Sure glad it's back!! Yeah Liviu, This series looks really cool. Is the history parts done pretty cool or what? Have you read his Oath of Empire series at all? I read the first book and enjoyed it, but, never did continue onwards with that series. I should see if I can find them..
Wow. Liviu I was pleasantly shocked to see the first two in this series at my library! Great to know that the first 2 Sixth Sun books are easy to find in libraries too. That's cool, Liviu. As fast as you read that's no problem, huh? That's cool, I'm curious to see which series you wind up liking better. I've read a few alt-his 'aztec' books (last one being "The Aztec Century" by Christopher Evans - need to say that I've been disappointed by all of them. The main and most annoying flaw is that the whole 'aztec thing' is reduced to a few specific names, pyramids and feathered masks.